And a family thing. And when I can wrap it all up, and make it a work thing (meaning getting paid for it), that’s a big plus. 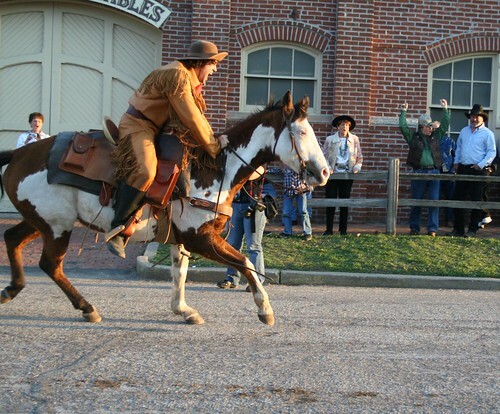 I went to the 150th anniversary celebration of the Pony Express in St. Joseph over the weekend. Now, some readers might have to be dragged kicking and screaming to any sort of museum or historic event, so if that’s you, fine. Read this. It’s good for you. I come from a long line of history honchos, museum magnets, hey-stop-the-car-let’s-go-see-that people. My mother was a history professor, and once made a taxi driver in Bulgaria stop and back up so “I can take a picture of that”. No, she didn’t speak Bulgarian. Long story. Dad could manage to take pictures of people and places where the signs plainly said, “do not photograph”. Another long story. So it’s no surprise I married a historian, and along with him came a whole family of music lovin’, story lovin’, history lovin’ people. When a sister-in-law reminded us of the sesquicentennial of the Pony Express, of course we- husband, me, and 12-year-old son— headed to St. Joe, MO for the festivities. It’s a history thing. And, of course, the husband and son took musical instruments—an evening of old-time music just happens when that side of the family gets together. So we packed up the family road tour, and headed west. Friday night was good food and good music with the family—I know, nobody else does this, but with that side of the family it’s tradition, it’s a history thing. Saturday, I wandered Patee Park and Mount Mora Cemetery in St. Joe, talking to people determined to keep history alive. Granted, some of their costumes weren’t precisely historic–it’s hard to take a guy in buckskins seriously when he has a cell phone on his hip instead of a six-gun–and the offering of camel rides gave the place a bit of a circus air, but other people made up for it. There was a shy, but engaging blacksmith using a coal fire who is the fourth generation of his family to work in ornamental ironwork [AUDIO: 3 min]; the guys who competed in the Buffalo Bill look-alike contest who spent months, even years, in research [AUDIO: 10 min]; a parade of horses, horses, and more horses! 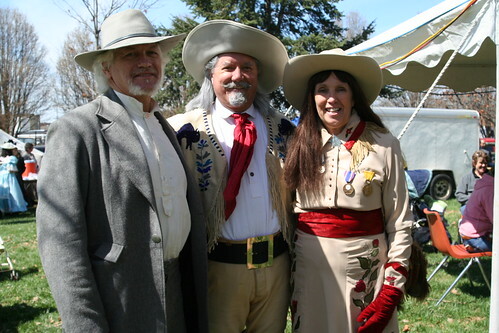 ; people reminiscing about the joyful times at the 100th anniversary when they were children; and volunteers at the cemetery who brought to life, in appropriate costume characters from the Pony Express era. Then, at the end of the day, as the sun dropped toward the Missouri River, a Johnny Fry (photo above) look-alike (there is some dispute about whether he was the first rider for the Pony Express) slapped the mochila (special pouch for the mail) onto a fidgety pony, leapt into the saddle, and at the boom of a cannon, dashed off toward… Sacramento? Perhaps. It IS a history thing, after all. PS: A few more photos here.